Hailing from Peoria Illinois, Arthur Burnett Benton was born there on April 17, 1858 to Ira Eddy and Caroline A. (Chandler) Benton. Two years after graduating from Peoria High School in 1877, he tried his hand at farming in Morris County, Kansas. It was there that he met Harriet Phillipina Von Schilling, a native of Pennsylvania, whom he married on May 17, 1883. His wife, who was 9 years his senior, saw his genius far beyond his agrarian vocation and convinced him to resume his education by enrolling at the Topeka, Kansas, School of Art and Design, in 1887. The following year he gave up farming and went to work for two years, as a draftsman in the architectural department of the Atchison, Topeka and Santa Fe Railroad. When he graduated from college, in 1890, he relocated to Omaha, Nebraska, where he worked as a draftsman in the chief engineer’s office of the Union Pacific. 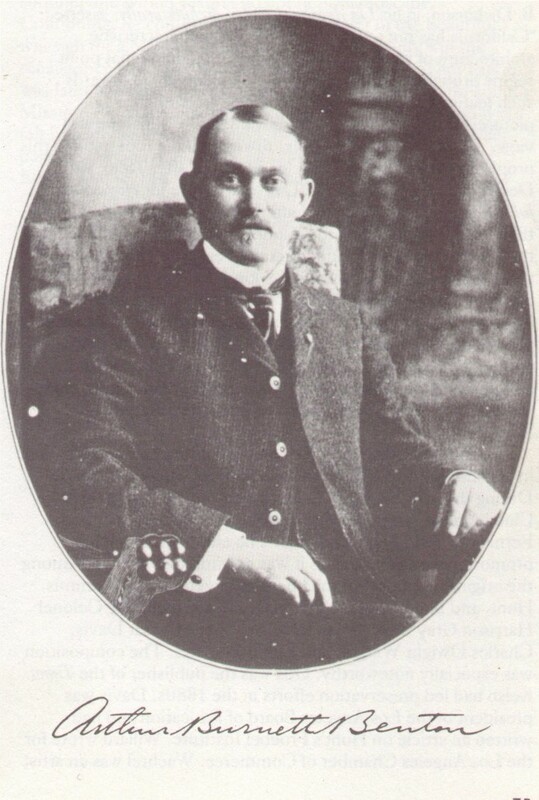 Arthur Benton soon chose to resign his position and moved, with his wife and young daughter, Edith, to Los Angeles, in 1891. In 1893, he went into an architectural partnership with William C. Aiken. 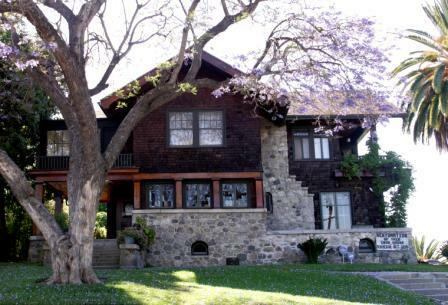 One commission for Aiken and Benton was a Shingle Style spec house in Angeleno Heights, for Mrs. Mary E. Stilson, the widow of William W. Stilson, the developer of that tract, in 1896. Benton soon opted to purchase that house, which was located at 900 Kensington Road. The following year, the addresses on Kensington Road were redone and the house became 801 E. Kensington Road. This was to be his home for the rest of his life. Later in 1896, Benton bought out his partner’s interest and remained solo for the rest of his career. That year also marked the formation of the California Landmarks Club, which Charles Fletcher Lummis founded to restore and preserve the old Spanish and Mexican Missions. Benton, along with Architect, Sumner P. Hunt, were among the original founders of the organization. Arthur Benton served as the club’s secretary. He also supervised the restorations of both the San Juan Capistrano and San Diego Missions. In 1900, he received the commission for the First Church of Christian Science, in Riverside, CA, which was built in that style. This building caught the eye of Frank Augustus Miller, who ran a nearby adobe tourist hotel, known as the Glenwood Inn. Miller had a vision of a great Mission Style hotel and in Benton, he saw the man to make his vision a reality. In 1902, work began on the first phase of the Mission Inn, under Benton’s supervision. He did several additions to the sprawling complex, including the “Cloister Wing”, which was modeled after the Mission in Carmel. Two major wings using different themes, and different architects, were added in 1913-14 (Spanish Wing, Myron Hunt) and 1930-31 (International Rotunda Wing, G. Stanley Wilson). Benton also designed a beach house, known as “Mariona”, for the Miller family in Laguna Beach in 1918. Benton is also known for his extensive ecclesiastical work, mostly for the Episcopal Church. He was an active member of St. Paul’s, in Downtown Los Angeles and many of his clients, both private and church, came from that association. Benton designed a number of Episcopal churches, starting with All Saints at Duarte, in 1897 (demolished in the 1970s), All Saints by the Sea at Montecito, in 1900, St. John the Evangelist in Chico, CA, 1904, Trinity Episcopal Mission, at Port Hueneme, which was later moved to Filmore, Holy Trinity in Covina, 1910-11 as well as St. Marks in Upland, at the same time and his last Episcopal commission, Church of the Advent, on West Adams, in 1925-26 are but a few of his designs for his denomination. In later years, he transferred his membership to St. Athanasius, in Echo Park. He designed a chapel there in 1902, which was demolished in the 1990s. Most of these church buildings incorporated Gothic and Craftsman features, making use of rich wood and traditional stonework, which had become a signature of Benton’s design skills, and which was preferred by his Episcopal clients. However, his First Church of Christian Science was not his only work outside of his own denomination or the Gothic style. Mary Stilson and her son, Fielding, who was an important industrialist, were also active members of St. Paul’s. Mary Stilson was also the corresponding secretary for the Landmarks Club. In 1906, he designed adjacent houses for both mother and son at 1048 and 1046 West Kensington Road, respectively. In 1907, his neighbor, Augusta Marshall, had him design a rear cottage at 794 E. Kensington Road. In 1913, this same neighbor had Benton add a second story to that cottage, turning it into two flats. Benton’s characteristic commitment to detail in design, as well as his making the back house, even though a different style, blend well with the Dennis and Farwell designed front house is an obvious testament to his abilities. In 1912, Benton did a major redo on his own house. The original 1896 structure was designed for his client, Mary Stilson. He had enlarged the dining room in 1904. Now, he made it his own design. From top to bottom, it was redone in the charm of Old England. He even set up a personal library in the basement of the structure, which boasts a lock plate originally made for the Mission Inn on it’s outside entry door. Ever the historian, Benton designed a new mantle, which he emblazoned with depictions of Medieval scenes with tiles at either end, denoting the dates of 1896 and 1912, the original construction and his remodel. Besides the Landmarks Club, he was also a founding member of the Southern California Chapter of the American Institute of Architects, for which he served as president several times, the Engineers and Architects Association of Southern California, which he also presided over and the Sons of the Revolution, for which he also served as president, just to name a few of his many allegiances. Another out of town commercial commission was the one-story Mission Revival “Plaza Center Building”, which was constructed in Patterson, California, in 1910. The building originally housed developer’s offices and the town’s Post Office. Today it serves as the local museum. At least three other major Hotels were part of his resume. The Mission Revival 1910-12 Arlington Hotel in Santa Barbara, which was virtually leveled in the 1925 Santa Barbara Earthquake, the Arrowhead Hotel, located in the foothills, North of San Bernardino and the San Marcos Hotel, which opened in Chandler Arizona. That town was founded by Dr. Alexander J. Chandler, who may have been a relative, on his Mother’s side. Dr. Chandler was an entrepreneur who was involved in the “City Beautiful” movement and envisioned his town as the ideal city in the desert South of Phoenix. He had Benton design the entire town, with broad boulevards and grand vistas. The Mission Revival themed San Marcos was to be the centerpiece of the perfect town. With the exception of the hotel, very little of Benton’s original design was ever built there. John Stephen McGroarty, the poet laureate of California, was well known for his Mission Play. He commissioned Benton in 1922 to design the Mission Playhouse in San Gabriel to supply a permanent venue for the play. Benton used a recreation of the front of the Mission San Antonio, at twice it’s original scale, as the façade of the building. It was later purchased by the city and became the San Gabriel Municipal Auditorium until it was damaged in the 1987 Whittier Narrows Earthquake. It has since been repaired and reopened under its original name. In 1923, Benton designed a home in Tujunga for McGroarty. In 1911, Benton designed a Gothic Castle, known as “El Nido”, for Lt. Governor Wallace, in what is now La Canada-Flintridge. In 1926, Benton designed a small Craftsman cottage, which he had built on top of a concrete garage he had earlier constructed at the rear of his property, possibly to be used as his architectural studio. It was originally built as a Japanese tea house. It was not too long after that was completed that he became bedridden. His last major work was the Riverside Municipal Auditorium, which was completed in 1927. It takes us back to Benton’s architectural roots as it was designed in the Mission Revival Style that he helped to pioneer. 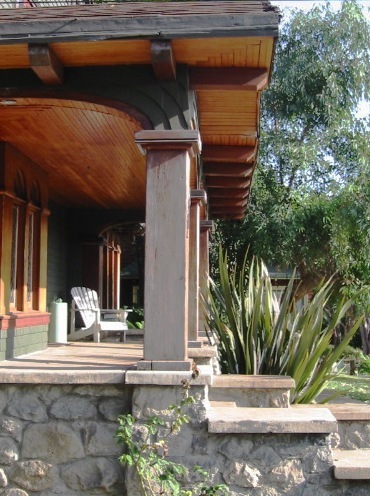 A style that had fallen out of favor by the 1920s, being supplanted by the Spanish Colonial and other European revival styles that were by then sweeping America. This style, however, is uniquely Californian and serves today to remind us of our own heritage as Californians. Arthur Benton passed away at his beloved Angeleno Heights home on Sunday, September 18, 1927, at the age of 69, leaving a rich architectural legacy in Southern California. Over the years, many forgot about him and his work. Yet, today, especially in the last two decades, historians and communities from Santa Barbara to Riverside, are finally recognizing his legacy and his true contribution to the historic built environment of Southern California and beyond.